The summer 2018 transfer window is open and plenty of Bundesliga clubs have been getting their business done with a number of youthful signings. 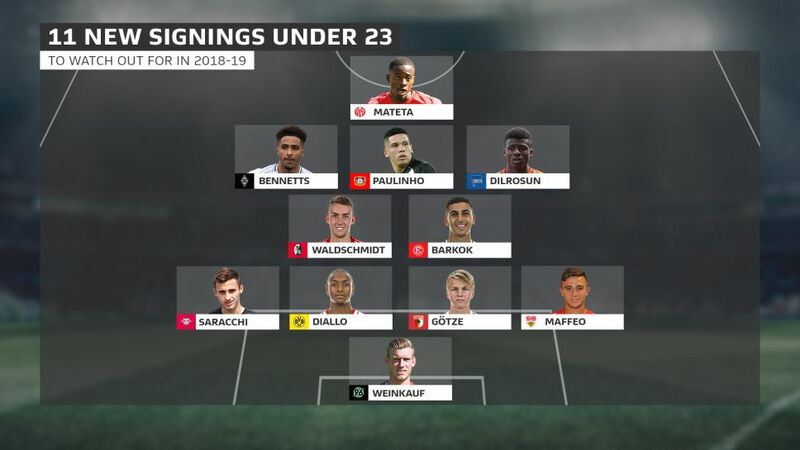 bundesliga.com looks at 11 new signings under the age of 23 who could light up the German top flight this season. Weinkauf is not the only goalkeeper hoping to make a Bundesliga bow this season, as Danish netminder Frederik Rönnow will battle it out with Felix Wiedwald to try to replace the departed Lukas Hradecky as Eintracht Frankfurt number one. Dutch custodian Mark Flekken, meanwhile, has moved from lower-league Duisburg to Freiburg. At 21, however, Weinkauf is the youngest new signing in goal with a chance of seeing some action. Having joined Bayern Munich from Werder Bremen in 2015, he had plenty of time to learn from the likes of Manuel Neuer and Sven Ulreich. He was a regular for their reserve side, and even made the bench for the first team four times over the past two seasons. After joining a club where he feels he can take the “next steps” in his career, Weinkauf will now look to challenge experienced keepers Philipp Tschauner and Michael Esser for a starting place at Hannover. “Leo is a very well-trained young goalkeeper with huge potential,” Hannover goalkeeping coach Jörg Sievers said. Maffeo only turns 21 in July, but the recent arrival from Manchester City already has plenty of first-team experience behind him. The Spain U21 full-back spent the past two seasons on loan with Girona in his homeland, helping them earn promotion in his first year and playing 33 games in La Liga last term as his side secured a mid-table finish. Having also played three games for Manchester City two seasons ago, Maffeo is now ready for a new challenge – one that former Bayern and current City boss Pep Guardiola advised him on. “Pep Guardiola spoke highly of the Bundesliga, and those in charge at Stuttgart went to great lengths to persuade me,” he said. Older brother Mario has shown how it’s done, and now Felix Götze wants to establish himself as a Bundesliga regular with Augsburg. The 20-year-old - who can play in defence or a holding midfield role - had a good apprenticeship over the past few years with Bayern and at the Borussia Dortmund youth academy before that. Now Felix is planning to become the next youngster to make a name for himself at Augsburg. Leipzig have earned a reputation for both spotting and developing young talent, and the latest one to watch out for is left-back Saracchi. The Uruguayan started out with local side Danubio but needed just one season with Argentine giants River Plate to really make his mark. Saracchi was part of Uruguay’s team at the U20 World Cup in 2017, and this year he played six matches in the Copa Libertadores – the South American equivalent of the UEFA Champions League. The speedy full-back’s “mindset and potential fit well” with Leipzig’s philosophy, according to sporting director Ralf Rangnick, while the player himself was delighted to join the team that finished sixth in the Bundesliga last season. Waldschmidt has already made headlines in the Bundesliga – marking his 21st birthday with a last-gasp winner against Wolfsburg two seasons ago that saved Hamburg from relegation. Waldschmidt got his second Bundesliga goal in another relegation six-pointer against Wolfsburg in April, but this time the 22-year-old attacking midfielder was unable to save his club from being demoted for the first time in their history. “I have the feeling that I’m in the right place for my future development,” the club's new number 11 said. A loan move is often a good way for a young player to build on what he’s already achieved, and Barkok will be hoping that his switch from Eintracht to newly-promoted Fortuna Düsseldorf will do just that. The 20-year-old midfielder has played in 27 Bundesliga matches over the past two seasons, and in 2017 he won a silver Fritz Walter Medal – given to the second-best German U19 player of that year. Barkok has started only nine league matches, however, and Eintracht clearly feel that the opportunity to earn more playing time is all the Germany U21 international needs. “We remain as convinced as ever by Aymen’s ability, which is why we tied him to a four-year contract in 2016 and have extended his contract by another year at the same time as agreeing this loan,” Eagles sporting director Bruno Hübner said. Paulinho will link up with Bayer Leverkusen when he turns 18 in mid-July. The rapid attacker – who can play on either wing or through the middle – made his professional debut as a 16-year-old and went on to play over 30 matches for Brazilian club Vasco da Gama. He even scored twice in this year’s Copa Libertadores before a broken arm checked his momentum in April. Nevertheless, Leverkusen had seen enough and moved to sign the teenager. The club's proven track record of nurturing Brazilian players played a major part in Paulinho’s decision. “Emerson, Lucio, Jorginho, Ze Roberto and Juan were fantastic players whose global career started at Bayer 04,” he told Leverkusen's website. Signing thrilling young wingers seems to be all the rage in the Bundesliga this summer, and Hertha Berlin have added their own in the shape of Dutch youth international Dilrosun. The former Ajax youngster, who turned 20 towards the end of June, was part of Manchester City’s U23 side before becoming Hertha’s first signing of the summer. The Amsterdam native said he learned many of his skills on the streets, and he is now looking forward to showcasing them in Germany. Goals were something of a problem for Mainz last season, since they managed only 38 in 34 league matches. The 05ers have moved to address that by convincing Lyon to part with Mateta, who had a hugely successful spell on loan at French Ligue 2 side Le Havre last term. The rangy 21-year-old helped them to the promotion play-offs, and finished the campaign with 19 goals in 37 league matches. No doubt encouraged by the progress fellow French players like Diallo, Jean-Kevin Augustin, Benjamin Pavard and Dayot Upamecano have made in Germany, Mateta is raring to go.